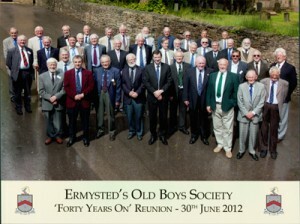 Old Boys who left Ermysted’s 40 years ago or more (Years up to and including 1974) are invited to our special ’40 Years On’ reunion dinner, which will be held at school on Saturday 28th June 2014. It is two years since the last such event so we hope you can join us this year. 11.00am-12.30pm Tour of the school – Senior boys will be available to act as guides. Archive material will also be on display in the Library/Refectory. 1.15pm onwards Lunch, followed by a welcome from Graham Hamilton (Headmaster) and Ken Oxley (Old Boys’ Society Chairman). After lunch No formal agenda is set but your time will be free for reminiscing and general conversation. Evening There are plans for an evening drinks event in Skipton town centre on Saturday 28th June, which will be open to all Old Boys of the school, not just those who left in 1974 or before. Please check back soon for details. Click here to download/open a booking form. If you have any questions, you can speak to Ken on 01756 790698. We would be most grateful if you are able to support our Centenary Appeal, to help raise funds for the next stage of development for Ermysted’s Grammar School. The school continues to grow in terms of pupils with a roll now in excess of 800. The next building project is to provide Sixth Form facilities appropriate for a school such as Ermysted’s, with approaching 250 boys now studying for A-levels. The school has planning permission for the project but insufficient funds to authorise work to commence. Old Boys have already contributed £30,000, but we need at least a further £20,000 to meet the amount the school will have to put towards the overall cost. Any contributions will be greatfully received – you can make a donation on the day of the event, or enclose some extra money along with the cost of your 40 Years On ticket.